If you’ve ever ventured into the network wilderness equipped only with manual processes, you know how challenging it can be to slog through a morass of unforeseen issues, one by one. While we applaud your pluck and fortitude, we’d like to suggest some innovative strategies. 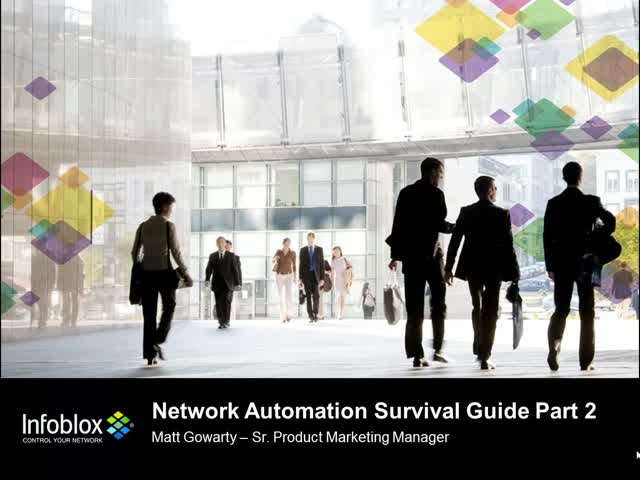 Part 2 of the 2-part series will illustrate how Infoblox can help you use network automation to reduce costs, increase efficiency, and prevent human error. By using Infoblox NetMRI to intuitively manage layer-2 and layer-3 network devices, you’ll experience the joys of automated discovery and visualization, change and configuration management, and compliance and policy validation, enabling you to run a highly dynamic network infrastructure and ensure success.